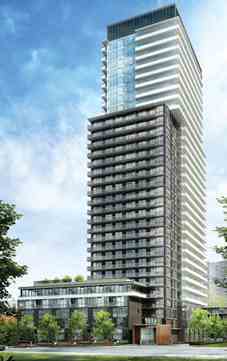 Following the extraordinary sales success of our elegant Republic condominium, Tridel now introduces 101 Erskine. This smartly tailored glass condo residence with a contrasting tonal profile is strategically tucked away, mere steps from the energy of midtown Yonge and Eglinton in Toronto. Yet this venerable neighbourhood Walkscore is also just moments from the subway, prestigious shops and superb dining. 101 Erskine's modernist sensibilities are echoed in its clean linear exterior design and refined interiors: charcoal grey, white and clear glass, copper clad front entry, stunning lobby, rooftop terrace with infinity pool and outdoor fireplace lounge, sublime entertainment spaces with private courtyard, alfresco dining lounge, sleek fitness amenities & a linear park walkway creating a link between Broadway and Erskine. lounge, dining lounge, as well as fitness amenities. First impressions matter. Which is why the hushed, light-infused lobby features several seating lounges, sculptural details and an inviting fireplace. A cordial Concierge ensures that every detail unfolds flawlessly. The various amenities of Club 101 promise evenings filled with a multitude of entertaining possibilities. There’s a bar area with LCD TV, various seating alcoves and a private Dining Room with movable privacy walls that can be opened or closed at whim. Perhaps most entrancing of all is the adjoining terrace, offering the option of outdoor gatherings and dining al fresco. The chic outdoor Fireplace Lounge provides a dramatic setting for gatherings with cocktails against a perfect Toronto sunset. Located just off the lobby, the light-filled Fitness Centre boasts top-of-the-line fitness equipment that rivals those of any premium gym. Six floors skyward, The Terrace On 6 awaits with glistening Infinity Pool and sun lounge for enjoyment from spring through to autumn. 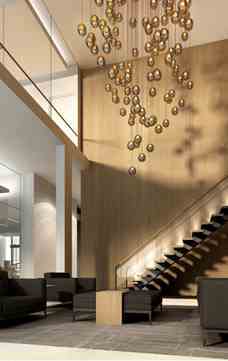 101 Erskine Condos also has a walkscore of 95/100! Which means that almost everything you need is a short walk away-restaurants, pubs, parks, banks, schools, etc. Ceiling Height : From 9'0" to 12'0"